With all of the hype about high protein - low carbohydrate diets, I think it's important to discuss the health implications of these diets and why the majority of them fail in the long run. 1. Carbohydrates do NOT make you fat! I hear all of the time from people that bread is a "no–no" and that they gain weight immediately after they consume it. This is false! Carbohydrates do not make a person fat. A person's intake and portion sizes will increase the calories consumed and, if not burned off, will metabolize into fat. The truth is that most of the foods containing carbohydrates are also served in larger portions. For example, when you order pasta at a restaurant, they serve you 4 cups of pasta! In reality, the recommended serving size of pasta is only ½ cup. Carbohydrates are not the enemy – ridiculous portion sizes are! Remember that carbohydrates are the primary energy source for the human body. Without them, a person will feel tired and lethargic. In particular, they are high in saturated fats, which are the artery-clogging, cholesterol-building fats. The American Heart Association strongly recommends limiting the intake of saturated fats for the prevention of heart disease. This increases the risk of osteoporosis (weak bones). Calcium is found in milk products that also contain carbohydrates. When avoiding carbohydrates, people also decrease the amount of calcium they are consuming. This can be harmful for proper bone health. Fruits, vegetables, legumes and whole grain products are our best sources of fiber. Again, most of these foods contain carbohydrates as well. It is essential to maintain proper fiber in the diet to prevent many different diseases (e.g., obesity, cancer and cardiac disease). Fiber is also one of the key ingredients to long-term weight loss. 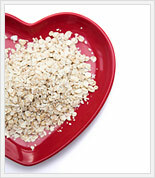 The recommended intake of fiber is 25 grams per day. The average fiber intake of a person who is on a high protein diet is only 10 grams! When the kidneys break down protein they produce byproducts. These byproducts can be harmful when their concentration becomes too high in the bloodstream. High protein diets are strongly discouraged for anyone with diabetes or reduced kidney functioning. Supplements cannot be used to replace them. Vitamins and minerals are best absorbed in the body from food sources, not through supplements. When it comes down to it, remember that moderation is the key to success! Whenever you see a diet that is telling you to "exclude" a particular food group, you should know right off the bat that it’s not the healthy way to go! Be smart and sensible and watch your portions!